Yamaha’s radical, reverse cylinder head YZ450F set the world on its ear when it debuted in 2010. Sure, the ill-fated Cannondale MX400 of 1999 had already introduced the concept to the motocross world, but the difference was that the Cannondale suffered from fuel-injection issues and a lack of power whereas the Yamaha worked well right out of the box. Today, the YZs are the only Japanese motocrossers to use this major mass-centralizing design feature. Unfortunately, the YZ450F hasn’t been the world beater that Yamaha had anticipated. 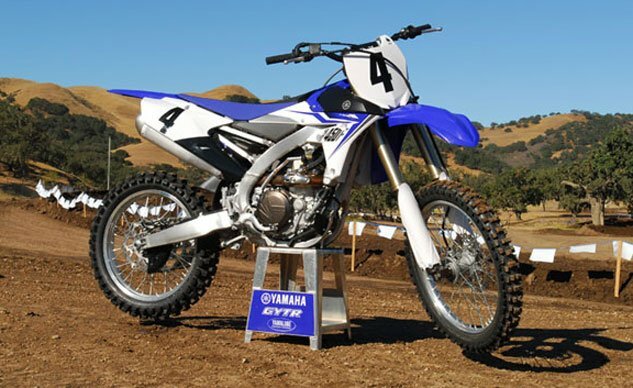 It has been a solid contender, however, and Yamaha’s all-new 2014 YZ450F is setting the course for better fortunes for Yamaha on the racetrack. Yamaha engineers developed it with three essential design goals: easy cornering; a lighter and more compact package; and a more usable powerband. 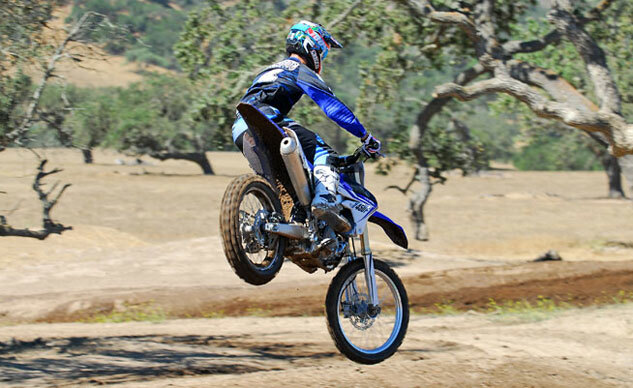 We got to try out the new YZ450F at the picturesque Zaca Station MX Park north of Santa Barbara, California. To evaluate the YZF at a high level, we enlisted the services of WORCS and SCORE off-road racer Ryan Abbatoye, still fresh off his runner-up finish with Kendall Norman in the Tecate SCORE Baja 500. 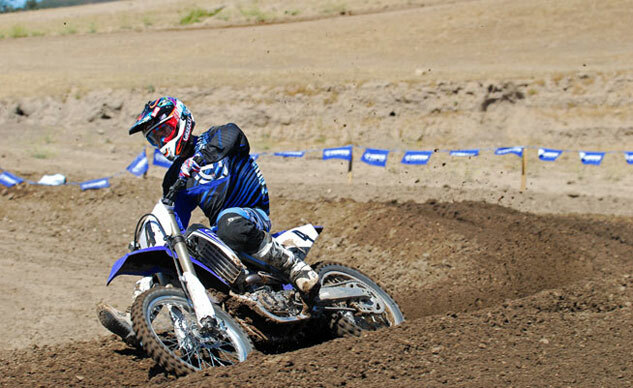 We put the 2014 YZ450F in the very capable hands of WORCS and SCORE off-road racer Ryan Abbatoye. We already knew that the YZ450F’s liquid-cooled, fuel-injected, 449.7cc, DOHC single is a powerhouse. The radically oversquare 97.0 x 60.8mm, bore and stroke, powerplant delivers tractor-like bottom end torque and high-winding top-end horsepower. 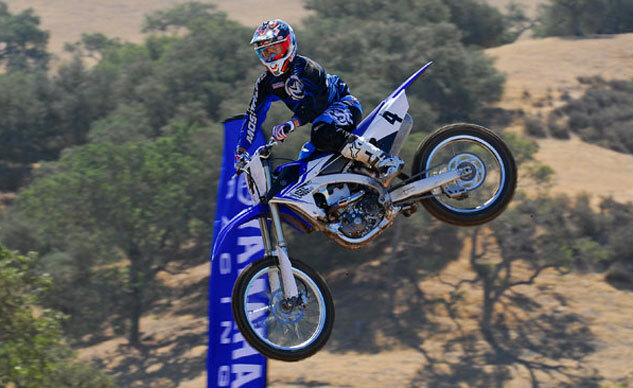 For 2014, Yamaha engineers were tasked with making the 450F both more powerful and more controllable. Accomplishing the mission required a whole new engine. Starting from the top, the airbox capacity has increased 265% (from 1216cc to 3230cc), and the filter shape has been changed from a flat element to traditional round element with a 35% larger surface area. A new airbox layout also eases filter maintenance by allowing access to the filter without requiring removal of the seat or fuel tank. Exhaust routing wraps the pipe entirely around the new motor. Increasing top end power to foster a more controllable power character may sound counter-productive, but that’s just what Yamaha did. Getting there required new intake cams that feature more duration than the previous cams and larger diameter titanium valves to help the motor breathe better. The new 37mm intake valves are 1mm bigger than in the previous motor, while the exhaust valves grow 0.5mm to 30.5mm. The engine also gets new intake and exhaust port shapes to tailor power right where Yamaha’s engineers wanted it. The 2014 Y450F also gets a new flat-top piston instead of a domed piston, and its combustion chamber volume is increased 0.9cc to deliver better low-end and midrange torque while still retaining the 12.5:1 compression ratio of the previous engine. 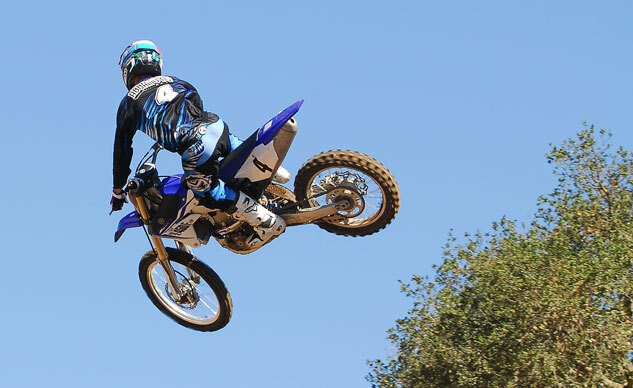 On the track, Abbatoye noted that the YZ450F makes strong power from bottom to top, but its greatest asset is the abundance of locomotive-style torque it generates right off idle. For all its grunt, the engine is smooth and its hit is forceful yet broad. Some of the credit for this feeling lies in the 450F’s new dual-map ECU, which includes a gear-position sensor to further optimize the fuel mapping and ignition timing. The new ECU also increases the 450F’s usable rev limit by 250 rpm. Our test rider appreciated the abundant bottom-end torque. However, throttle response through the 450F’s Yamaha Fuel Injection (YFI) and Keihin 44mm throttle body didn’t feel immediately feel quite right, according to Abbatoye, who noted a tendency for the muffler to sound as if it were shooting ducks when the throttle was closed on the downhill sections of the course. So we spent a little time experimenting with the fuel injection and ignition mapping. Yamaha’s Jonathan Belding plugged in the accessory GYTR Power Tuner, dialed up the fuel to 12% rich across the rev range at partial throttle setting and also retarded the ignition by 3 degrees. Presto! The 450F was instantly cured, with crisp and clean fueling and ideal power output for the Zaca Station track. Traction on the wet, tacky Zaca clay was high, but we get the impression that the 450F’s tractor-like power delivery could easily be made to hook up just as well on a dry slick track. We look forward to testing that theory on several So Cal tracks this summer. 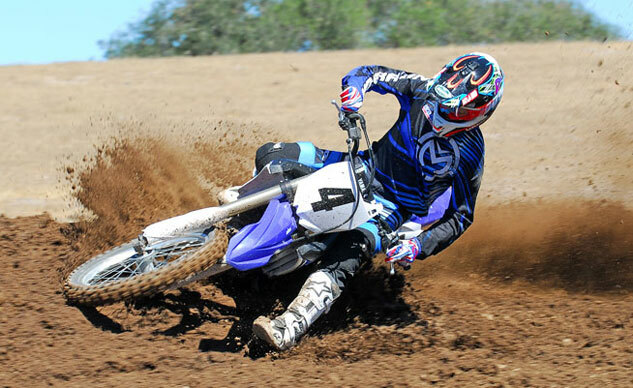 The YZ450F’s five-speed transmission shifts as smooth as silk and its clutch action is excellent. The 2014’s shift quality comes courtesy of new shift forks along with shift bars that float on springs to reduce binding. The rear shift bar has also been increased from 10mm to 12mm, and the shifting mechanism now features a bearing to reduce friction when going from gear to gear. Other changes include a new shift lever and shift shaft. The 450F’s clutch has also been beefed up via new springs and clutch plate friction material. Spring pressure is increased by 10% to accommodate the motor’s power. It’s hard to say whether the YZ450F’s chassis trumps its motor in terms of improvements, but the 450’s all-new Bilateral Beam chassis is impressive. The new frame moves the front wheel 10mm closer to center of the bike and also features a stronger swingarm pivot. Thicker material in its hydro-formed mainframe spars and a new shape and location of the tension arm that bridges the spars, along with new engine brackets, allowed Yamaha engineers to tailor the chassis rigidity for a more comfortable feel. More front wheel weight bias is also intended to improve the front-end traction when cornering. Also, the 450F’s front Axle diameter has been increased 2mm (from 20mm to 22mm) to increase front-end rigidity. Steering was heavier than expected, despite changes to the chassis designed to make it more flickable. And Yamaha has really taken its mass centralization to a whole new level with the YZ450F. 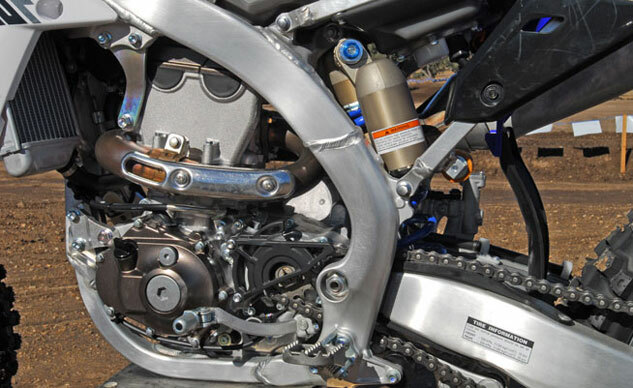 In order to move the bulk of the chassis weight closer to the center of the bike, Yamaha engineers created a new, narrower and smaller subframe, and a new more centrally mounted fuel tank. 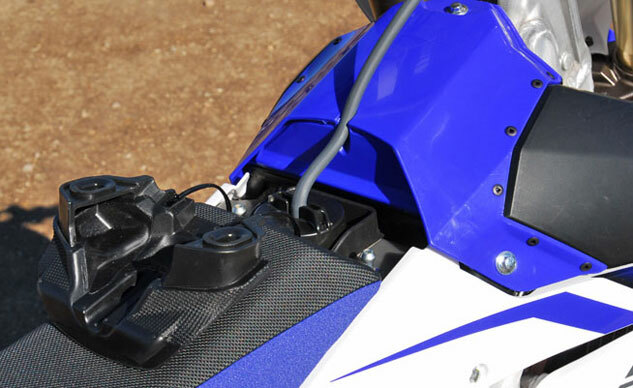 The most obvious change, however, is the YZ450F’s wraparound exhaust system. The mass of the muffler is now lower and 7.3 inches closer to the center of the bike to keep things really compact. The goal is to create a machine that changes direction and attitude more willingly, but our experience at Zaca station was mixed. Abbatoye reported that the chassis basically handles well and corners well, but it steers more deliberately and also feels heavier than we expected it to. On the other hand, the bike felt light and neutral in the air, allowing Abbatoye to flick it however he liked. A slight headshake at high-speeds on one of Zaca’s rougher downhill sections was another handling issue that required attention. Over this section the fork would dive and change the steering geometry just enough to induce headshake. At least this one was a simple fix. Adding two more clicks of compression damping in the fork and backing out the high-speed compression damping in the shock by a quarter turn settled everything down and alleviated the issue completely. The YZ450F’s suspension action is excellent tackling high- and low- speed hits no trouble and offering excellent initial damping over small bumps and huge jumps. Part of its fantastic initial sensitivity may be due to a new polishing process that Yamaha uses on the inner fork tubes of the YZ450F’s fully adjustable KYB Speed-Sensitive System inverted fork. The fork is also 3% more rigid due to a taper change of the fork sliders. Both the fork and the 450F’s fully adjustable KYB single shock get increased spring rates for more damping control, and the shock’s reservoir has been moved from horizontal back to vertical to accommodate the new fuel tank and exhaust. Yamaha’s mass centralization efforts also yield slimmer ergonomics, more room and better fore and aft movement for the rider. Most noticeably, the fuel filler neck is now mounted under the very front portion of the seat, which is located via two posts and grommets and attached to the main portion of the seat using two nylon tethers. It looks weird not having a visible fuel cap in its normal position on top of the tank, but the design makes it easier than ever for the rider to sit forward and plant the 450F for a tight turn. The filler cap has been moved under the seat, allowing the rider to more easily shift forward on the bike. The 450F was already pretty racy looking before, but its new look borders on space-age. The missing fuel tank cap (it’s hiding under the seat) slim radiator panels and flat seat look futuristic even by today’s standards. The 450F’s graphics are now embedded into its new one-piece radiator shroud, making them impossible to peel off and more difficult to scratch. Of course, the bike also gets all-new plastic, including the radiator shroud, side panels and rear fender. Efforts were made to minimizes the size of the body panels, and give them a more compact, aggressive appearance. Overall, we’re stoked with the changes Yamaha made to the YZ450F. It offers easy-riding yet thrilling Open-class power, a compact chassis and excellent suspension, making it a serious contender for the class title as well as any local, regional or national motocross championship crowns. And maybe the best part of all is that the new YZ450F retails for $8490, same as last year’s model. So if you waited for a year while you’re buddy decided to buy a 2013 YZ450F, or vice versa, one of you is going to be pretty upset. Even with the upgrades, the 2014 doesn’t cost a penny more than the 2013 model.